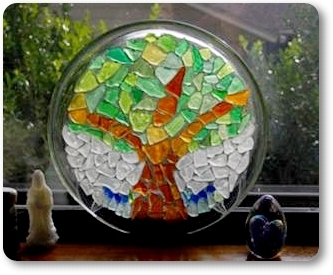 "For this tree, I used a glass plate for the backing. Then I glued the glass on with E6000 . I didn't use a stand, it is just leaning against my window. On my other tree, I used thin Plexiglass and made a stand." Thanks for your compliments on my trees. The one that is on the plate is just sitting in the ledge of my window. As for the other tree, I only use one piece of the plexiglass, and it needs to be the thin kind. Since I made it, I haven't been able to find any that thin. You can use thicker but it is harder to cut the tree shape. I wish I had better pieces of glass to use, but my supply of really good glass is limited since I live in Texas! Love your tree! How do you get it to stand? I purchased some cheap wire trees this year and wrapped pieces of sea glass and attached to the tree and then tied little bows on - it was cute too! I was just curious if you use only one tree shaped piece of plexi or 2 and how does it stand?